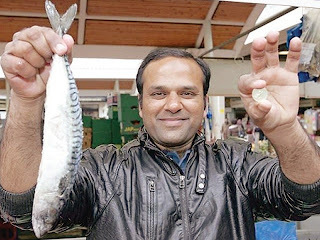 One Pound Fish Pakistani Muhammad Shahid Nazir Gets Hit On Internet after he launched his official music Video one pound fish which got millions of views in few hours online. Muhammad Shahid Nazir is a Pakistani from a small city near Lahore Pattoki who is now a days in UK for Education. He used to sell fishes in Queens Market for paying expenses of his education. He used to sing One Pound Fish in huge voice for selling fishes. One day someone uploaded his video which went viral on Internet. after its success Shahid Nazir has launched his official Music video which is also getting millions of views online. Family of Shahid Nazir is very happy on the success of his song.